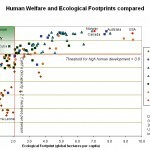 As a follow-up to my article on the historical necessity of Green Communism, I would like to 1) refute some common myths and misconceptions about limits to growth-induced collapse, 2) clarify the concept of Green Communism, and 3) elucidate why the only realistic way to prevent collapse now is to force through a “sustainable retreat” by an “ecotechnic dictatorship”. Let’s take as a starting point our current situation. From the late 1970’s or early 1980’s, calculations indicate that humanity exceeded the long-term carrying capacity of the Earth. Fossil fuel resources are being used up at an unsustainable rate, producing an increase in what William Catton called the “phantom carrying capacity“, which now supports many of the Earth’s surplus billions. However, should the energy base becomes too weak to sustain this phantom carrying capacity, there will be a catastrophic fall of the human population as the Earth system snaps back into equilibrium, producing a massive Malthusian dieoff. The recent peaking of world oil production and accelerated Arctic methane release are but the early portents of hard limits to growth on our finite planet. We are in a predicament, dependent on an industrial Machine whose insatiable appetite for ever higher levels of material throughput will eventually doom us all. A Machine and its brother, Mammon, with whom we have made a Faustian bargain. We have to somehow wriggle out of this physical and spiritual dependency on our industrial Mephistopheles to avert a collapse of industrial civilization by 2050, but continued dithering and denial makes the changes required ever more drastic year by year. Had the world begun the transition to sustainability in the 1970’s, a great deal of personal freedom and private affluence could have been preserved; as of today, it looks ever likelier than only a Leviathan invested with total power over society can haul us back from the brink of the Olduvai Gorge. The world’s industrial infrastructure and services run on cheap fossil fuels and electricity (much of which is derived from hydrocarbons). Past global energy transitions, such as the one from biomass to coal, took 50 years to accomplish. It is not unreasonable to expect a similar timescale for the hydrocarbons to renewables transition, especially since unlike in the past we will be shifting towards energy sources with lower EROEI’s and lower energy and power densities. At the same time, we will have to deal with the problem of anthropogenic climate change, which seems to exhibit more signs of veering out of control with every passing year. In the face of these challenges to industrial civilization, the world system may continue on one of the following three paths: 1) business as usual, 2) limits to growth, and 3) sustainable retreat. The rough shape of humanity’s ecological footprint trajectories are summarized for each scenario in the graph below, where 100 is a rough estimate for the carrying capacity of the Earth in 1960. My vision of three possible future overshoot scenarios. Though business-as-usual cornucopia sounds like a good plot for a literary homage to Michael Crichton, few informed people can seriously believe that technology and markets by themselves will enable us to extend our Faustian bargain with the Machine long enough to cheat Gaia when she comes to collect. The likeliest outcome of business-as-usual hubris is a flattening plateau, following by a global, cliff-like collapse in human numbers, technology, and socio-political complexity. There are four major sources of evidence for holding this theoretical viewpoint. 1) Limits to Growth. According to the findings of the widely-publicized 1972 study by the Club of Rome, exponential growth is unsustainable on a finite planet, even when markets and technological growth are accounted for. The results of the “standard run” of their World3 model contained in the 2004 updated version of the study are reproduced below. Crushed between the Scylla of resource depletion and the Charybdis of pollution overload, collapse occurs within the first half of the 21st century. The Limits to Growth standard run leads to collapse early in the 21st century. A recent report by Graham Turner of CSIRO Sustainable Ecosystems, A comparison of The Limits to Growth with 30 years of reality, showed that world system dynamics in the post-1972 era closely tracked the forecasts of the Limits to Growth standard run. Not good. 2) Resource Depletion. In support of the theory that the world will experience severe problems with energy are depletion studies of the three major fossil fuels – oil, natural gas, and coal. Let’s summarize each one. Peak oil was most likely reached in 2008, and from 2011 depletion will decisively overtake new fields coming offline – most of which will be located in remote locations like deep offshore or the Arctic, and will require huge investments for exploitation to begin. Natural gas will peak by 2030, but its decline profile will be much steeper than for oil; however, there are hopes of prolonging the gas age by exploiting shale gas and coal seam gas. Finally, although on paper coal reserves should last centuries, the bulk of the deposits are very low EROEI and may even require more energy to extract than they will ever produce through combustion. It should be noted that even though US coal extraction by volume has seen continued increasing uninterrupted in recent years, when measured by total energy it peaked in 1998, and has since been on a slow downslope. Finally, tar sands, oil shale, and other unconventional sources of oil require a phenomenal amount of fresh water and natural gas to extract, they are extremely polluting, and have a very low EROEI; it is completely unfeasible that they will make good the gap. 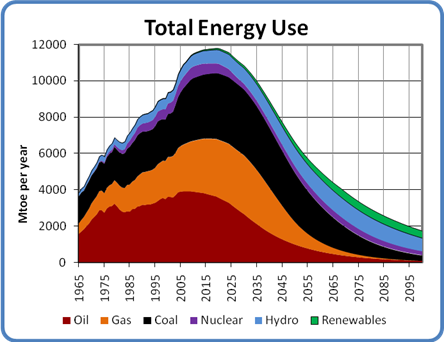 Paul Cherfurka’s projections of future global energy usage by source. Could renewables save us? Solar PV is improving rapidly, but it starts from an extremely low base. Wind power is already well established, but there are serious questions over its real EROEI level – can industrial civilization be run on wind, or is its real inefficiency masked over by the prior cheap oil subsidies used in the making of wind turbines? Yet the crucial problem facing wind and solar are their low energy and power densities, which makes them unsuitable for providing the base load that a stable electricity supply demands. The only real hope is to massively expand next-generation nuclear reactor construction, in conjunction with other renewables. However, this will take a intense effort spread over decades, and it is not clear that this effort will be sustained as the system comes under assault from ever fiercer energy and climate shocks – and that’s assuming uranium extraction remains profitable in net energy terms. In conclusion, the evidence indicates that from 2030, the net energy available to industrial civilization will begin to decline; furthermore, due to diminishing marginal returns, by that time there will be little scope for more efficiency improvements. This lends support to the Limits to Growth standard run model that industrialism will decline by the first half of the 21st century due to resource shortages. 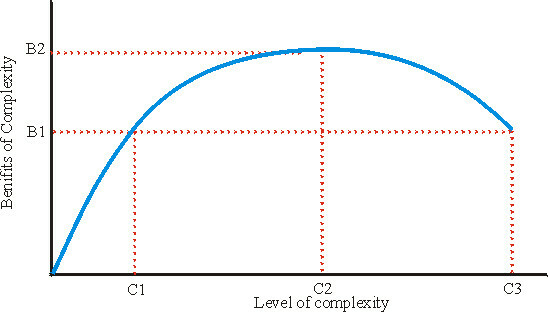 3) Tainter on diminishing returns to complexity. In his celebrated work on The Collapse of Complex Societies, Joseph Tainter posits that societies increase their complexity in order to solve certain problems. For instance, one of the major reasons behind the formation of the Chinese state was its provision of a bureaucratic-administrative mechanism for implementing irrigation and flood control works, which increased the carrying capacity of the land. Unfortunately, the flip side is that societies need to expend ever more organizational and physical energy to maintain a certain level of complexity, a complexity which is subject to diminishing marginal returns. Eventually, this expenditure undermines the society’s economic base and opens up a large potential gap where said society could reap the same benefits but at a lower level of complexity (and cost). At that point, there arises the risk of collapse. Tainter’s collapse model: at C3-B1, there appears a risk of collapse back down to C1-B1, at which point “hypertrophied states” tend to use coercive tools to try to prevent this from happening. Civilization reaches its absolute peak of power, health, well-being, etc, at C2-B2. When it begins to run up against problems, the typical reaction is to continue increasing complexity, even though marginal costs now exceed marginal benefits. At C3-B1, there appears an appreciable risk of catastrophic collapse back down to C1-B1, because at that point people would retain the same benefits but at a much lower cost. Furthermore, by this point a civilization’s natural legitimization mechanism, economic growth, will have long since failed; more artificial forms of legitimization have to be found (e.g. the idea that the Empire is sanctioned by God), as well as ever higher levels of physical coercion (e.g. the security forces, authoritarianism) – for instance, the Western Roman Empire adopted Christianity and experienced its highest levels of militarization just a century or so before its final collapse in 476 AD. In addition to society’s tendencies to try solving its predicaments with the failing tools of the past (ever more complexity), in systems characterized by competitive peer polities, such as our own anarchic international system, there is a further reason for maintaining complexity – anyone who doesn’t can’t support an army, and those who don’t have armies get conquered for their resources. In these systems, organizational complexity is maintained absolutely regardless of costs, and the extractions necessary to sustain it are legitimized by the fact that every other state within this system is doing the same thing. Only when every unit of the system reaches economic exhaustion does the resulting power vacuum finally allow for a rapid, global collapse. A collapse more reminiscent of the relatively rapid fall of Mayan civilization, than of the Roman Empire’s slow decline over the centuries. 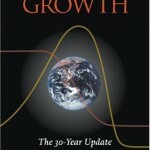 The Limits to Growth model has to be updated to reflect these political and geopolitical feedback loops. The likely result is that the increasingly authoritarian, “hypertrophied states” of future decades, locked in deadly competition over each for resources, will stretch out the smooth peaks shown in the Limits to Growth standard run into decades long plateaus, as shown in my graph of “World Overshoot Scenarios”. However, when collapse does finally come, it will be far, far steeper than it would have in a world without politics. 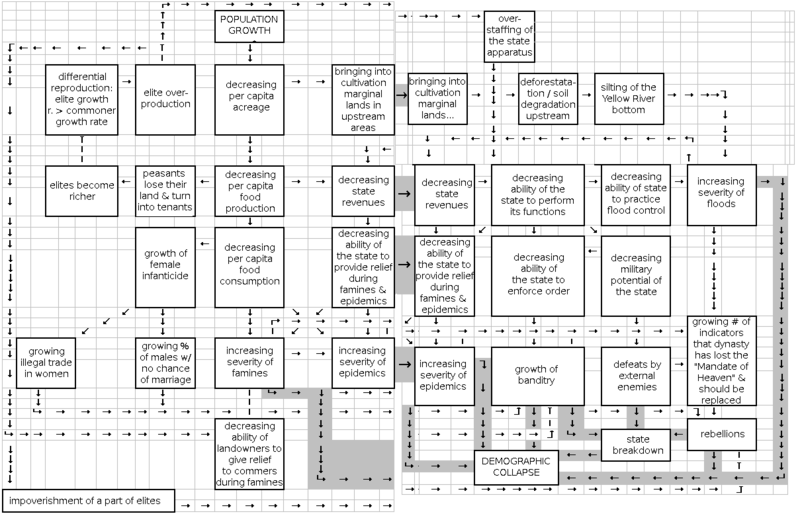 The artificial prolongation of industrial civilization will result in an explosive closing of the awning “potential gap” on the complexity graph, plunging the world into famine, anarchy, and dieoff. 4) Cliodynamics. Another valuable analytical tool is the recently-developed science of “cliodynamics“, which attempts to mathematize “big history” by modeling the systems dynamics of the rise and fall of civilizations. In particular, its insights can teach us a great deal about the nature of Malthusian stress and political-demographic collapse. Here is the basic story. Over millennial timescales, technological growth produced a secular rise in the carrying capacity of the land, which allowed the human population to grow to its current seven billions. However, over shorter timescales the Malthusian tendency for populations to grow faster than technology or the increase in carrying capacity typically resulted in diminishing per capita surpluses and a plateauing of the population. The system became fragile, as surplus stocks accumulated during the “Golden Ages” of plenty were drawn down, and climatic, political, and geopolitical perturbations during the stagnation resulted in sharp dips into dearth. During these times of dearth, peasants began to turn to banditry, producing rising internal violence in the countryside, which forced other peasants into the cities and further decreases food production. Faced with their own shortages, elite predation also grew, further squeezing the peasantry. Eventually, a “tipping point” was reached, in which elite predation, internal violence, and depreciation of carrying-capacity improvements (e.g. roads, canals, grain silos, redistribution mechanisms, irrigation works, etc) became self-sustaining and spiraled out of control. In the ensuing “cascading collapse”, the central state withered away into a patchwork quilt of warring fiefdoms, and the drastic reduction in the carrying capacity of the land resulted biblical-scale Malthusian dieoffs. However, as soon as the violence died down, the population was found to be far below the carrying capacity of the land, and there was a new “Golden Age” of growth until it once again bumped up against the plateau of carrying capacity. This explains the basic mechanism of pre-industrial Malthusian political-demographic cycles. Flow chart representation of the collapse dynamics in a typical Chinese political-demographic cycle. Now Korotayev et al (the cliodynamicians) believe that ever since the industrial revolution, technological growth has reached such great velocities that the increases in carrying capacity accruing from it now far surpass any Malthusian pressures. According to them, the era of cyclical collapses is now at an end. However, a closer examination shows that 1) their models of technological growth are flawed – they do not account for the diminishing returns seen for technological progress in recent decades, nor 2) do they note that in most cases post-industrial technology has not been in the form of low-maintenance knowledge, but embodied in the (fossil fuel-dependent) machines of industrial civilization. But their greatest omission is that much of the post-1900 increase in carrying capacity has come not from technological growth, but from the technologically-enabled exploitation of the high-EROEI hydrocarbon “resource windfall” – oil, coal, and natural gas. Once these resources become scarce again, the technology used to exploit them will become as chimerical as the fossil fuel-powered machines and phantom carrying capacity they once supported. The end result will be similar to the same Malthusian-era collapses analyzed by the cliodynamicians. 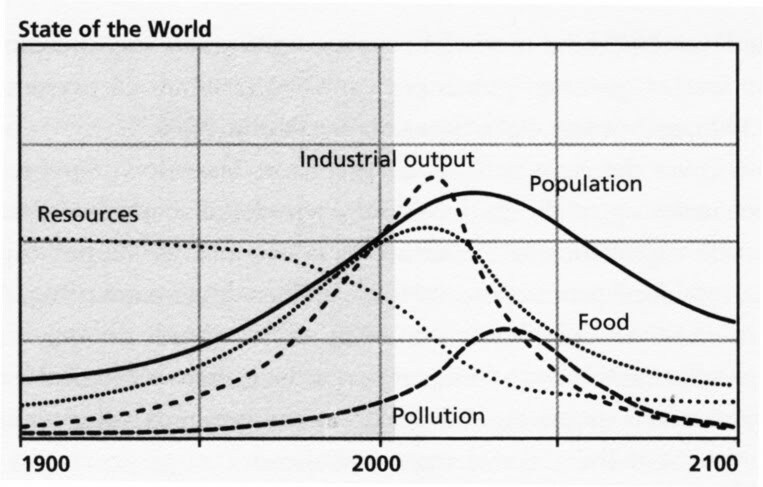 An era in which surplus per capita draws to the level necessary for mere subsistence, characterized by dearth and famine in the bad years, and limited recoveries in the good years; a plateau that increasingly slopes down, until a series of severe perturbations (climatic disasters, resource wars, etc) so disturbs the world system that negative feedback loops take over and the entire system collapses into a prolonged Dark Age. In conclusion, drawing on the theoretical works of systems modelers (Limits to Growth), energy modelers, collapse theorists (Tainter), and modern cliodynamicians (Korotayev, Turchin, Nefedov, Khaltourina, etc), we can paint a general outline of the next 50 years. Ever more human effort will be mobilized or requisitioned by ever more coercive “hypertrophied states” to compensate for the effects of declining emergy availability (peak oil, exploitation of lower-EROEI energy sources, diminishing returns to energy efficiency, and the effects of credit collapse, resource nationalism, and geopolitics), falling agricultural productivity (fertilizer shortages, heatwaves, rivers and fossil aquifers running dry, rising sea levels inundating coastal farmlands, etc), and other costs accruing from exponentially rising climate chaos. Those regions which collapse first, nowadays called “failed states”, will be taken over by neo-colonial industrial powers to contain the chaos and acquire resources to buy just a little more time for their industrial civilization. Physical output will plateau and stagnate, while real living standards begin to degrade at an accelerating rate. Eventually, a series of shocks – climate catastrophes like the conflagration of the Amazon or a “hydroxyl collapse”, poor harvests resulting in global famine and pestilence, perhaps even a final, total war of late global industrialism – will finally make the Machine give up the ghost. The collapse of fossil fuel availability will render usless most modern technology, everything from microchips to electric cars and photovoltaic panels. This will result in a political-demographic collapse of unparalleled severity that reduces the human population to below one billion souls within a few decades, ushering in a post-industrial “Rust Age” on a polluted, desertifying, and drowning planet. The “Rust Age”, or “age of salvage” (M. J. Greer). As shown above, business-as-usual will be anything but usual, and will almost certainly lead to impoverishment, oppression, totalitarianism, wars, and eventual global dieoff. There is still however a path out, should we choose to take it – a global “sustainable retreat” to below the limits, which if accomplished within the next generation could still stave off collapse and allow us to continue with the development of a truly sustainable civilization, one based not on growth of physical output and consumerism, but on intellectual, cultural, and spiritual self-actualization. This ideal or utopia I shall call Green Communism, a scientific fantasy in which man reaches reconciliation with Gaia, socio-economic classes disappear, and the coercive state itself withers away into oblivion. However, Green Communism cannot be attained while human psychology remains myopic, short-sighted, competitive, and individualistic; nor is any such transition possible while the world is in overshoot and increasingly hemmed in by limits to growth. As such, a transitory period is required – an “ecotechnic dictatorship” that would concentrate onto itself the political legitimacy and coercive tools to force the world back onto a sustainable path. But first, to forestall the inevitable criticisms and condemnations, I must point out why alternative roads to the sustainable transition are no longer viable, even if they ever were in the first place. 1) The Anarchist Delusion. Disillusioned with the “System” – states, corporations, etc – many “peakists”, “doomers”, survivalists, etc, advocate community-based retreat on a spectrum ranging from weed-smoking “hippies” teaching themselves organic permaculture to “frugal patriots” holing up in their Idaho “doomsteads” with prodigious quantities of canned food and firearms. However, very few of them have truly broken off the ties that bind to industrial civilization; learning to survive on sustenance agriculture in true pre-industrial fashion is very, very hard work, and almost no-one has the will and perseverance to follow through. Furthermore, they will receive a rude awakening in the coming era of limits to growth-induced authoritarianism and collapse. Governments don’t like anarchists, especially nasty ones. Period. One of my critics tried to prove an anarchic lifestyle works by posting a Wikipedia link to a “list of anarchist communities“. But on closer examination, practically all their modern manifestations collapsed within just a few years, either from internal causes or due to state suppression. Perhaps the anarchists will “band together” to protect themselves, he went on to suggest? Will there be enough of them to keep the warlords away? That would certainly be a good idea as the government’s writ collapses and rural violence soars. However, one very important thing is that “bandits” are so-called violence-specialists; it is what they do, their profession. For a settled anarchist community, it will be difficult in the extreme to muster the economic, administrative, and military capabilities to successfully accomplish all three of the following necessary tasks for surviving in an anarchic environment: 1) producing enough food and goods for community subsistence, 2) managing internal conflicts, and 3) defending themselves from the bandits, psychos, and warlords. Drawing resources from one task will undermine the likelihood of fulfilling another. In practice, what will almost certainly happen is that either the anarchist communities begin paying tribute / protection money to the warlords (thus creating a dependency through which they can later be brought to heel), or they find it more profitable to become warlords themselves. After all, the first kings and nobles were all essentially just the most successful racketeers! The fundamental predicament (not problem) of most biological life-forms is their tendency to overshoot the carrying capacity of their environment. One of the most powerful theories for the rise of the state was its capacity to raise the carrying capacity of the land, which postponed overshoot and collapse, and in general made state-centered societies far more powerful than the hunter-gatherer tribes that they displaced. Now let’s turn to today’s reality. If all states were to magically vanish right now, so would the administrative and coercive tools to sustain global industrialism. Soon afterwards, the underlying carrying capacity-enhancing infrastructure such as the global oil industry, fertilizer production, cybernetics, etc, would depreciate into irrelevance from lack of maintenance. Anarchy will reign and the global population will plummet back down to the few millions of people that primitive technology and band-like social organization could support. You may dismiss or despise the hand of the state that feeds you, but you will likely sing a different tune when it withers away into your anarchic paradise. 2) Why Individual and Community Retreats are no Real Solution. Another strand of the anarchist delusion is that since collapse is unavoidable, it is best to retreat from the System while you can, pay off your debts, cut the ties that bind, etc. But quite apart from the implicit resignation to the inevitability of the untimely deaths of billions of people, it cannot be stressed enough that any collapse today will be global (see Tainter above), and the chaotic fluxes it produces will be so violent than any community, no matter how prepared or resilient, could be casually swept away by the tidal waves it would generate. I do not deny that it pays to get personally and psychologically prepared for collapse, but this must be part and parcel of a multi-pronged political effort to avert collapse if possible, and dampen its severity should avoidance prove impossible. The idea that you can hole up in a doomstead and survive against the imminent zombie hordes is particularly inane (read the War Nerd‘s entertaining essay Apocalypse Never to find out why). Finally, defeatist notions of the inevitability of collapse – such as those advanced by Dmitry Orlov, who is strongly opposed to all forms of political activism – are in many ways as counter-productive as the mindless business-as-usual mentality of modern society. The traditional American focus on individualism and self-reliance only worked in the age of abundance which characterized their entire history (the US GDP has been higher at the end of every decade than at the beginning since its founding). This era is at end and will never return. This will be a major shock for Americans, more so than for most people whose memories of cyclical and Malthusian dynamics are more recent, but they will all have to get used to it. 3) The Gramscian Road to Green Communism will take too long. Say what you will about them, but at least the Green Party has a political plan for a sustainable future. This plan involves changing society’s core values to embrace concepts such as “ecological wisdom” and “community-based economics”, through means of grassroots political action and infiltration of key political and economic institutions. Hopefully this will displace the pro-growth bipartisan consensus and enable the democratic enactment of policies that will steer the world back towards sustainability. As I argued in Roads to Green Communism, however, this “soft” approach to the sustainability transition is doomed to failure. Guilt-ridden liberals may be moved to make $10 donations to Greenpeace or boycott electricity consumption for a grand total of one hour per year (on the so-called “Earth Hour”), but this will not be enough to persuade them to make real sacrifices. It gives me no joy to say this, but the hard truth is that left to themselves, free from coercion either by their peers or by the Leviathan of the state, even enlightened individuals will not take anything more than symbolic steps to reduce their ecological footprint. Why? All humans are prone to a psychological blindsight called “creeping normalcy”, or what Jared Diamond in his book Collapse calls “landscape amnesia”. This describes a process in which slow, detrimental changes to the environment go unnoticed by the general population because of their slowness and gradualism, but whose eventual accumulated impact becomes devastating. One tragic example would be the Easter Islanders who chopped down all their trees, accelerating the tempo in the last decades of their pre-collapse civilization in order to construct ever bigger moai (statues) to honor the gods that legitimized the tribal chieftains who ruled over them. Human psychology reacts well to immediate threats, but when they are far-off and abstract – such as the declining EROEI of energy sources of climate change – mobilization is much more difficult. As the biggest McMansions and tallest skyscrapers have been erected in the present era of peak oil, there is nothing to suggest that modern civilization is any wiser than the Easter Islanders. As of now, changing this psychology quickly will be extremely difficult, if not impossible. In the Soviet Union, it took around two generations to transform the bulk of society from having a traditionalist-peasant worldview, to an urban-secular one – and this despite uninterrupted state propaganda and coercion. Today, even most educated people see the green movement as a bit weird and extremist, if not as evil socialists planning to enslave the world. And we certainly don’t have even a single generation to wait, let alone two. Gradualism is not a solution, it is suicide. 4) Our current System is blinded by Institutional Myopia. Could the current System bail us all out, like it did the politically connected Wall Street oligarchs? Almost certainly not. Modern society is run by experts and technocrats, if indirectly (their recommendations have to be balanced against corporate interests and the popular will, which is what politicians are there for). However, those same experts are either part of, or suborned by, the System – the sum total of the texts and power relations that make up a society’s set of beliefs. The former category, which includes government policy-makers and corporate strategists, suffers from an “institutional myopia” which gives answers in advance and precludes all questions questioning the legitimacy of their own institutions. For instance, what can a rational, capitalist state – interested in self-preservation, predicated on unlimited economic growth, and confronted with irrefutable evidence of the dire consequences of business-as-usual greenhouse emissions on the world’s climate – do to resolve these contradictions? The answers are meaningless buzzwords and Orwellian oxymorons like “green growth”, “skeptical environmentalism”, and “clean coal”; the forbidden question relates to the efficacy of industrial capitalism as a system to confront the imminent challenges of man-made climate change. The latter category, encompassing private think tanks and academia, have a greater degree of freedom in asking inconvenient questions. However, it is ultimately the state that pays academics their salaries. Biting the hand that feeds is always dangerous, especially if their fangs contain the poison of the forbidden question. Anathema unto them. Therefore, academia’s answers also tend to conform to the reigning paradigm. Even the intensified legitimization of the “hypertrophied state” vanishes, as do the coercive tools that kept it together well past the point when it should have naturally collapsed. Science and rationalism retreat, and its former agents – intellectuals, priests, tax collectors, etc – are liquidated, as the Sun dawns over a new Dark Age. Hence, as soon as humanity and its technologies become obsolete, the biosphere’s limits to growth will become equally irrelevant to the future of intelligent life on Earth. If we manage to hold on long enough to unleash this technological singularity – and avoid its various perils and pitfalls – then the super-abundance produced by self-assembling nanotechnology will eliminate scarcity, the “dematerialization of production” will make classes obsolete, and the borders between reality and virtual reality will fade into oblivion as the Earth metamorphoses into Tlön. Fully freed from material constraints, humanity will be able to build the purest forms of Green Communism… should it wish to. There is one problem, however – industrial civilization may not survive long enough to catapult itself out of overshoot. For the projections suggest that a singularity-driven transition to sustainability may elude us, for both “singularitarians” and the Limits to Growth proponents tend to place their respective events – Singularity and civilizational collapse – in the 2030-50 timeframe. This may be the last answer industrial civilization will find out. In his excellent book “Our Ecotechnic Future“, Michael John Greer outlined his thoughts on the future of our civilization, which he saw as going through the following four stages: 1) “abundance industrialism” (1950-2010), 2) “scarcity industrialism” (2010-2050? ), or the plateau on my “World Overshoot Scenarios” graph characterized by rising coercion, impoverishment, and resource wars, 3) the “age of salvage” (2050?-2250? ), in which civilization scavenges the detritus of late industrialism to sustain a very low-level, primitive industrial system, and 4) the “ecotechnic future”, in which post-industrial technologies in spheres like renewable energy or biotechnology, scarcely-conceivable today, may reset the world on a path of truly sustainable development in harmony with Gaia. Such an ecotechnic age will be close to the Green Communist ideal. 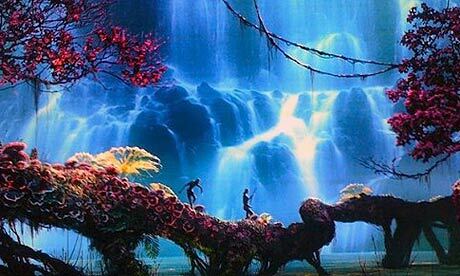 Perhaps the humans of the ecotechnic age would even resemble the Na’vi people from the film Avatar, in which an ostensibly primitive society has managed to “network” itself into Mother Nature on an incredibly intimate level, allowing its members to lead what appear to be very fun and fulfilling lives. However, is it really necessary to endure a catastrophic human dieoff and a centuries-long wait for the sustainable transition to Green Communism that may not even come about? 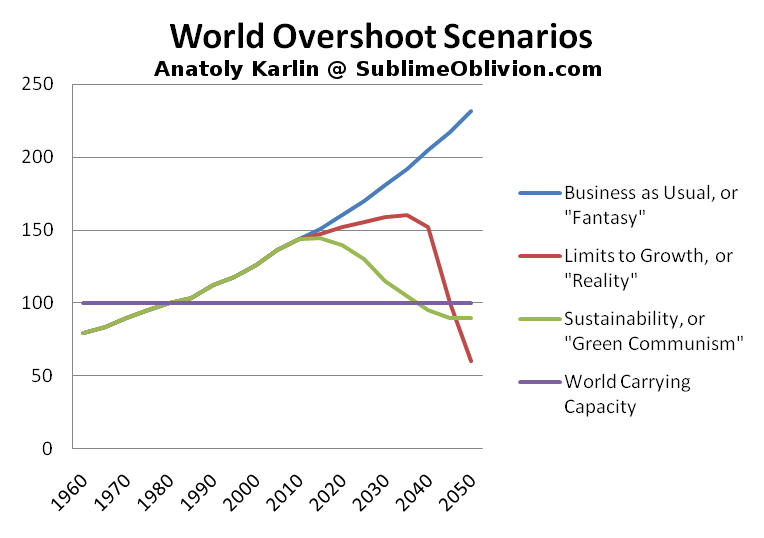 Or perhaps there is still a chance, however slight, of effecting such a transition through a sustainable retreat starting from today, as shown under “Green Communism” in my graph of “World Overshoot Scenarios”? I think that given the will, there’s a way – an ecotechnic dictatorship leading the people towards Green Communism. This system will be based on three pillars – reinforcing resilience, educating the people, and preparing for collapse. These pillars will be supported by the full power of the modern state and technology. A) Reinforcing Resilience. Technocratic central planning using the latest tools of operations research and networking to minimize waste while maximizing real living standards. The legitimacy of the state is not based on creating prosperity or opportunity, so it will be ideologically resilient in the face of the economic decline that is necessary to reduce physical throughput to levels consistent with a retreat to global sustainability. Resources will be funneled into 1) intensive, targeted research in computer science, cybernetics, sustainable energy generation and food production, geoengineering, systems dynamics, and cliodynamics, 2) the provision of social goods such as education, preventative healthcare services, high culture, and social support to the indigent, and 3) internal security and military forces necessary to defend the fledgling ecotechnic republic from hostile forces within and without. 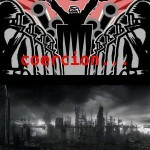 The ecotechnic dictatorship is a democratic society. The state will make strategic decisions by balancing their decisions between opinion polls and expert panels – much like modern China’s experiment with “deliberative dictatorship“. Since corruption and economic sabotage will be immensely harmful in a world suffering from resource shortages, it will have to be stamped out without mercy. One workable method is to institute a system of universal 2-way sousveillance to detect corruption and free-riders; since this mechanism is “horizontal”, in contrast to the “vertical” nature of traditional surveillance, it will reinforce ecotechnic democracy. The people will be able to observe trials and electronically vote on criminals’ punishments. How to maintain enthusiasm and prevent the ideological ossification of the regime’s elites? Through a dedication to meritocracy and the power of modern electronic technology to enforce transparency. Promotions will be based on technical competence and devotion to the cause as judged by one’s peers; greater power will gain one greater material perks and privileges. One might object, how is this different from the current System that needs to be overthrown? Realistically, some level of hierarchy is necessary and inevitable. Once society acquires a certain level of size and technological development (like our own), it needs a corresponding level of socio-political complexity to sustain itself, and that in turn requires a hierarchy. You need people at the top to set certain the limits and restrictions by which the world is to be dragged back from overshoot. Unless we return to primitivism (impossible with the size of today’s populations) or manage to achieve a technological singularity (then we’ll talk about it), all hierarchy cannot be abolished without a large fall in carrying capacity. That said, under the ecotechnic dictatorship, there will be nothing on the scale of the awning inequality chasms of today. Furthermore, thanks to the power of modern networking technologies, power can be distributed horizontally to an unprecedented degree. The ecotechnic elites will be subject to greater scrutiny than those below them. Though this all sounds restrictive of individual freedom, even dystopian, it is nonetheless a valid and probably morally superior alternative to anarchy, collapse, and dieoff. (Nonetheless, it should be borne in mind that a reversion to authoritarianism – furthermore, a socially unjust authoritarianism – is in any case virtually guaranteed in the last throes of the business-as-usual scenario). For we can only achieve a rapid enough sustainable retreat back to within the limits if the transition is backed by a powerful, global, and universal coercive force, or in other words, Leviathan. B) Informing the People. The second pillar of the ecotechnic dictatorship is its focus on reforming human psychology from its accumulative-materialist basis to progressive, transcendental values of ecotechnic sustainability. This is the fundamental and necessary legitimization behind the ecotechnic dictatorship and its march towards Green Communism. The end goal is to coax a real “gift economy” into being (as opposed to a centrally planned one), perhaps with the help of social engineering and widespread psychosomatic therapy. As soon as these ecotechnic values percolate throughout society, the necessity for the powerful state will vanish, and the ecotechnic dictatorship can be allowed to wither away as a new spirit of universal kindness and spiritual oneness, a state of complete sobornost, bathes humanity in the ether of Green Communism. C) Preparing for Collapse. Though it would be great if the ecotechnic dictatorship managed “sustainable retreat” successfully, as a regime orientated towards the future it must always keep in mind the possibility of its own failure and demise, a demise that would inevitably lead to global collapse. Hence, it will devote a black budget into making secret preparations to “buffer” human civilization against the possibility of collapse by creating Arctic “lifeboats” or repositories containing seed stocks, banks of knowledge, etc, whose locations will be entrusted to a society of dedicated Guardians. The goal of these Gaian priests and priestesses would be to function as the “bookleggers” and “memorizers” of Miller’s post-apocalyptic A Canticle for Leibowitz, preserving knowledge and culture into the post-collapse Dark Ages. 1) Is collapse under the business-as-usual scenario truly inevitable? Or am I underestimating the capability of markets and technology to overcome the restrictions posed by finite resources and the laws of thermodynamics? 2) What are the chances of effecting a “sustainable retreat” before it is too late and energy shortages and climate chaos destroy industrial civilization? Can such a transition really be carried out from the grassroots level and gradual culture change, or is the capitalist-industrial System too entrenched for that to work? 3) If an “ecotechnic dictatorship” as described above or something similar is necessary to prevent collapse, how should we go about implementing it? Through Gramscian infiltration and subversion of the current System, or a decisive revolutionary break that, in Zizek’s words, “does not occur within the coordinates of some underlying global matrix, since what it achieves is precisely the “reshuffling” of this very global matrix”? 4) How should the “ecotechnic dictatorship” legitimize itself, and how should it defend itself from its numerous enemies within and without – preferably without degenerating into all-out tyranny? Indeed, how much liberalism can we afford? 5) And how can we “globalize” the Revolution so as to prevent our ecotechnic enclave from being smothered in its cradle by outside capitalist-industrial Powers?